For the first time ever, the Cherry Cup has been won by the bellringers from St Mary’s Church, Doneraile. The Cherry Cup Competition is organised annually by the Southern District of the Irish Association of Change Ringers. 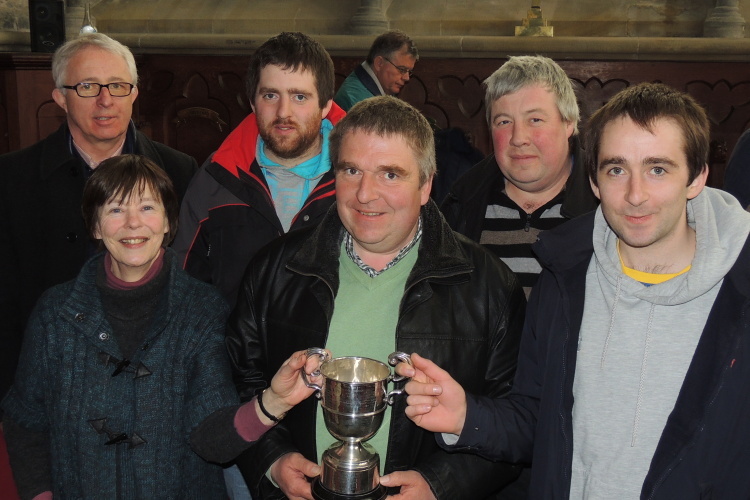 Bellringers from St Mary’s Church, Doneraile who won the Cherry Cup, l-r Eddie Gabriel, Julia Lysaght, Roy Deane, David Deane, Mark Buckley & Paul Deane. Well done everyone in Doneraile. In the Diocese of Cork, Cloyne and Ross the art of change-ringing – a team of people ringing a set of tuned bells in a series of mathematical patterns called ‘changes’ – is practiced in a number of churches in the Diocese: Doneraile, St Fin Barre’s Cathedral, Cork; St Peter’s Church, Bandon; St Fachtna’s Cathedral, Rosscarbery; and Abbeystrewry Parish Church, Skibbereen. This entry was posted in Community Involvement, Diocese, Parish News, People from the Diocese. Bookmark the permalink.